Daily Monitor — It is a shame for a minister to ask for a bribe from foreigners, Ugandan president Yoweri Museveni has said. Mr Museveni said he gets reports of some of his ministers asking for bribes from foreign investors to facilitate their investments in the country. “How do you tell a foreigner that you have failed to complete your house or pay school fees for your child? If you fail, talk to your [National Resistance Movement] party, not a foreigner,” he said. Mr Museveni equated such government officials to rats that damage the stored crops. “Struggle to live within your means, corruption is disgusting and will be stamped out. In this five year-term of office, corrupt officials are going to be dealt with accordingly. In this term the corrupt officials are going to see how a Muyekera (resistance fighter) looks like,” he added. 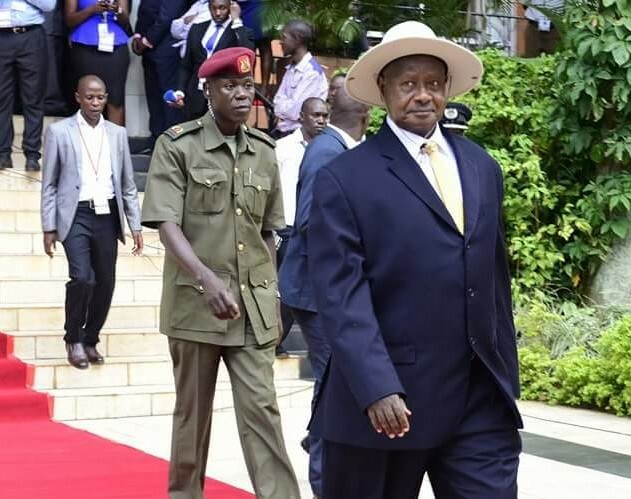 President Museveni soon after delivering the State of the Nation Address 2016 at Kampala Serena Conference Center. Mr Museveni said former president Idi Amin’s regime was blamed for corruption because most of the officials who served in his government were illiterate. “When we were fighting Amin, we would say there was corruption because they were illiterate. But for educated people to be corrupt, it’s disgusting,” he noted further. According to him, the Shs4 trillion that was lost in Uganda National Roads Authority (UNRA) – in which a number of ministers were implicated- could have constructed a 5000kms of road. Mr Museveni made the remarks in his State of the Nation Address on Tuesday during the second sitting of the first session of the 10th parliament at Serena Hotel in Uganda’s capital Kampala. Mr Museveni also talked about industrializing the country which he said is dominated with foreign products. “I cannot have a country which is a supermarket of foreign products. I’m told there are some young people who make a living by importing second hand clothes. This is good but also suicidal to our economy,” he said. Source — Daily Monitor Report and NBS Television video.